Welcome to our Café Casino review! Please don’t forget to contribute to the page by sharing your honest experience with other OnlineCasinoBluebook.com readers. This online casino was established in April 2016 and has a distinguished pedigree. Cafe Casino gives United States players a super friendly gaming platform in where they can enjoy an excellent assortment of gaming content. Gamblers can wager real or play money using their PC, smartphone or tablet. Players have about 300 games to choose from and new games are continuously being added. Online slot options include 3-reeled, 5-reeled, I-slots or multiple paylines. There are about 200 slots, including Arabian Tales, Beach Bums, Football Frenzy, Lion’s Roar, Panda Party and Robin Hood. They even have jackpots that reach up to $500,000. The Blackjack choices include Classic, Single Deck, Double Deck, and Perfect Pairs. For table games, you can choose from Baccarat, Craps, Caribbean Hold ‘Em, Pai Gow, European Roulette, American Roulette and others. The video poker games include Deuces Wild, Jacks or Better, Sevens Wild, Loose Deuces, Joker Poker, Single Hand, 3 Card, Double Bonus, Double Double Bonus and Mystery Bonus. Specialty games include Bingo, Gunslinger’s Gold, Keno, Scratch Cards, and Sudoku. However, at this time, there are no live dealer games. Players will appreciate the speed in getting winning payouts. Card counters will enjoy the single deck Blackjack game and slot players will find that many of the slot games are high volatility with bonuses and provide for some very loose wins. Players will find that the mobile app for CaféCasino seamlessly integrates all the functions as the desktop. Just remember to increase the bets on the slots when using the app because the slot spin amount is often lowered on the app as a precaution. Players safety and privacy is the number one priority. This casino has multiple layers of security. Enhanced security is used through the introduction of a four-digit PIN, which players will be prompted to create when they log into the new site for the first time. All data is secured with SSL (secure socket layer). In addition, all data is encrypted to ensure privacy and protection. Players can rest assured that their personal information is highly protected. Some players may be prompted with a security alert when accessing the casino, this is normal and part of the sites safety protocols. Many people rave about the generous Welcome Bonus. Gamblers can choose either the 1. Super Play Max Welcome Bonus or 2. No-Max Welcome Bonus. Players can earn a deposit bonus of 500% – up to $5,000 with the Super Play Max Welcome Bonus. There is also a bonus $10 free chip that might be available. This includes a 10X max cash out. Players must satisfy the 35X playthrough requirement to qualify. Others might not want their cash out maxed, so they can choose the No-Max Welcome Bonus. This 100% No-Max Welcome Bonus is up to $1,000. To be eligible, players must satisfy the 25X playthrough requirement. The welcome bonus is fantastic and all players should make sure they get the most out of this super generous welcome. There is also the Weekly Mystery Bonus appearing on Thursday. Some might like the Bitcoin Bonus. 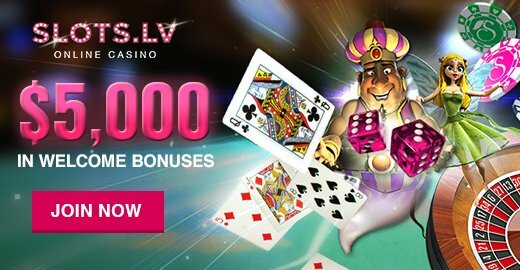 Customers can choose between two options: 600% bonus up to $6,000 with 35X playthrough or 150% bonus up to $1,500 with 25x playthrough requirement. Cafe Casino has a very special VIP program called Perk Points. The Perk Points, Tier points, and the VIP program reward frequent play. Perk Points are awarded to players for any games they choose to play. 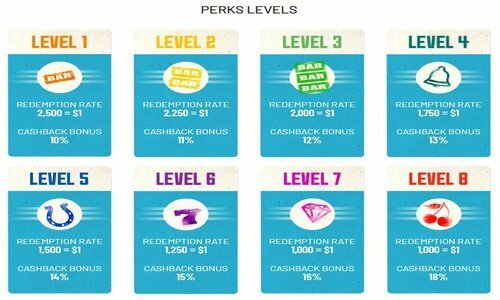 All levels of the Perk Points include cashback bonuses, up to 18%. There is also a $100 friend referral bonus. Every time players refer a player who completes a deposit, they get $100! This referral bonus is unlimited, so the potential is fantastic! Overall, they know how to treat their players with the ultimate VIP experience and with awesome casino bonuses. The software providers include Rival, BetSoft, Makitone Gaming, Revolver Gaming, and Realtime Gaming. The smooth-running Cafe Casino app is available on mobile phones (iOS and Android) and tablets. Cafe Casino is powered by many popular gaming software companies. This makes them stand out against the competition. There is no shortage of game selection to choose from, they have a gigantic selection of the hottest games available. The games run quickly and there is little lag time. 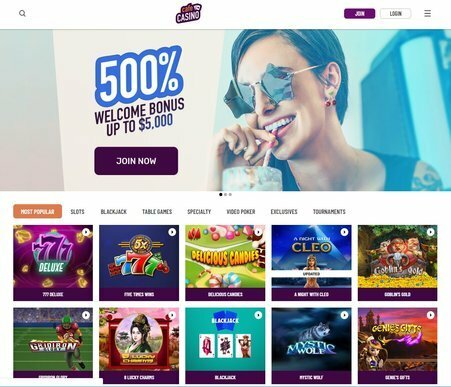 Some additional pluses for this casino are the enhanced user interface, making navigating and finding games & promos faster and easier than ever before. Cafe has a huge selection of slot machines and slots with progressive jackpots. In addition to a fantastic collection of slots, the casino has some great specialty games. Players can take a quick break from playing slots to enjoy a variety of blackjack, roulette, dice games and craps. The easy to use interface makes it easy to jump right into the action of the games. Also, we enjoy the casino layout and ability to search for games with ease. This casino has an impressive amount of tournaments, which are happening all the time! Check their site for a full schedule of their tournaments and for more details on how it works. Players can win massive jackpots from participating in these tournaments. Competing against other live players is truly a thrill. Players can view the winning prizes before the tournament starts and play some of their favorite slot games while inside tournament mode. Customer support is via FAQ, phone, Live Chat or email 24 hours a day, seven days a week. Expect to receive a phone call after registration. As customer support wants to make sure all players are satisfied with their experience. Players can contact the customer support team 24/7 to make certain that their experience is always enjoyable. If at any time players have any concerns about their time at the casino, they are encouraged to reach out to support. Please call toll-free at 1-888-364-1850 or email the team at service@cafecasino.lv. Expect a variety of banking options. There is a minimum deposit of $25 through Bitcoin, Bitcoin Cash, and credit cards like American Express, MasterCard or Visa. They encourage all players to deposit using Bitcoin. They offer some very generous bonus offers for players who use Bitcoin at the casino. The min. amount and max amount, wagering requirement and possibly the approval time may, in fact, differ from one deposit method to the next. The money deposit and withdrawal options are rather limited. Otherwise, they provide you with an engaging way to make a little money by playing your favorite casino games. Withdrawal is via Bitcoin, bank wire transfer or check by courier. Bitcoin withdraw is between $10 and $2,000, but VIPs can withdraw as much as $9,500. Bitcoin withdrawal might take up to 72 hours. The minimum check withdrawal is $50. A check might take 4 to 7 business days. A wire transfer takes longer, from 5 to 10 business days. There is a $2,500 cash out limit every 3 days for fiat currency. For Bitcoin, you can withdraw $2,000 every 7 days. Players can also request a bank wire. For additional questions about deposits or withdrawals, please reach out to the friendly customer support team. Cafe Casino is owned by Lynton Limited Group, which also runs Bovada.lv and Slots.lv casinos. The games are certified by iTech Labs. CafeCasino is regulated and has its results are audited and tested on a monthly basis. They are under the same umbrella of some very well established casinos. This makes them a very trustworthy casino and their customer support is above par. Cafe Casino is licensed and regulated by the Kahnawake Gaming Commission. They opened their doors in 2016. All in all, the expertise of the parent company (Bovada, Ignition Casino, etc.) has created a well-organized display with hundreds of games to choose from. The casino is relatively new on the scene, and they have a lot to offer to players. The graphical user interface is clean, uncluttered and easy to use for any player who enjoys online gambling. There are plenty of promotions available on the sidebars, and players will find it easy to find their promotions and special bonuses. Making deposits and completing withdrawals is a smooth, simple process. All players will love the gargantuan welcome bonuses, VIP Perk program and excellent customer support. Thank you for reading our CafeCasino review! As with all of our reviews, we would love and appreciate your feedback. Share your experience, or reach out to us with any questions!